Our God is faithful, we boast in the strength he has given us for every season, the will to stand at our post even in opposition. All the glory belongs to him. Halleluiah! 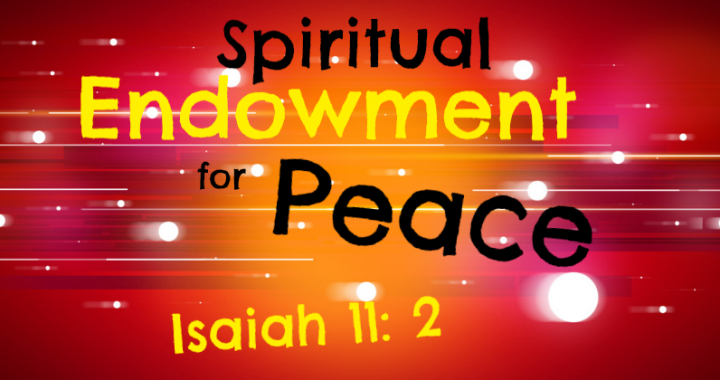 The attributes of God, expressed by Jesus are spiritual endowment for peace – love, joy, peace, forbearance, kindness, goodness, faithfulness, gentleness and self-control. And above all, the sealant, that is the Holy Spirit. Because a life governed by the the Spirit will yield life and peace. In the midst of our adversaries and the face of persecution or pain, the fruit of the spirit still overcomes. As Christians, we face opposition from the kingdom of darkness daily, from Satan and his cohort. But thanks be to God, our Father who has given us a name that is above all names, that at the mention of the name of Jesus every knee on earth and under the earth will bow. The Bible states in Matthew 22:15 ‘Then the Pharisees went out and laid plans to trap him in his words’. The Pharisee were determined to prove Jesus wrong and they planned to ensnare him by his own words. Have you been in a situation where you have been manipulated, misunderstood or lied against. In the case of the Pharisees, Jesus knew their evil intent by the Spirit and he did not loose his peace. Two things were in operation here, the Spirit of discernment and wisdom. Jesus suffered the greatest prosecution by being nailed to the cross and laying down his life for us all. He took the shame, the scorn and the beating. Jesus said, “Father, forgive them, for they do not know what they are doing”. In the face of prosecution, Jesus remained faithful to his mission, he prayed for those prosecuting him. Pain causes us to loose our peace, but only for a moment; the Spirit comes to restore our peace. When Jesus heard about the death of Lazarus, his friend. He wept. But he knew an opportunity was being staged by his Father. Then Jesus said to Martha, “Did I not tell you that if you believe, you will see the glory of God?” (John 11:40). Lazarus took off his tomb cloths and everyone present saw God’s glory. Isaiah 11 gives a deep account of the divine nature of our Lord and Saviour Jesus Christ. Jesus was able to overcome all the challenges because he was endowed with the Spirit of wisdom, understanding, knowledge, counsel, might and the fear of the Lord. We have access to the same today. The Lord has opened the floodgates of heaven, now we only need to believe and receive. In your quiet moment, at His feet, listen to the voice of the Father. He will give you keys to receive peace during the times of opposition, prosecution and pain. In Jesus name, Amen.